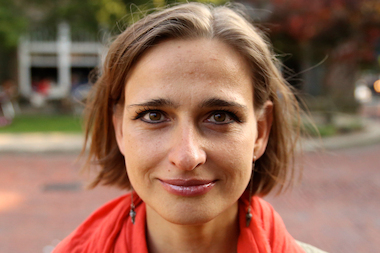 Ewa Kern-Jedrychowska is a reporter/producer for DNAinfo covering Forest Hills, Rego Park and Jamaica. After immigrating to the U.S. from Poland in 2001, Ewa got a job at the Polish Daily News, where she covered immigration, politics and community news. She has also freelanced for various media outlets, reporting on ethnic groups in New York, from the Russian speaking community in Brighton Beach to Greeks in Astoria. Her print and radio work has appeared in The New York Times, Feet In 2 Worlds, on WNYC and Public Radio International’s "The World"
She earned her master’s degree in Anthropology in 2009 from Hunter College, writing her thesis on gentrification in Greenpoint. Among the journalism prizes she has won is the New America Award from the Society of Professional Journalists for “Polish Immigrants in a Changing City,” a series of radio pieces produced for WNYC. Originally from Warsaw, Ewa now lives in Briarwood. Fun Fact: An avid birdwatcher, Ewa travels around the world following rare species. Recently, she went to Costa Rica to see a quetzal. The second annual film fest will run from Aug. 3 to 12. The Forest Hills Chamber of Commerce says it does not have enough money for the lights this year. The store, at 99-01 63rd Rd., will officially open sometime in November. Paris Baguette will replace RadioShack, which closed earlier this year. The patients contracted the disease over the past two weeks, officials said. The rerouted line now includes a layover where passengers have complained of being charged twice.